Join the discussion on our forums! Come discuss Pterrordax Hatchling over in our dedicated Pterrordax Hatchling discussion topic. It would have been really adorable if he were a different color, maybe green. Agreed. 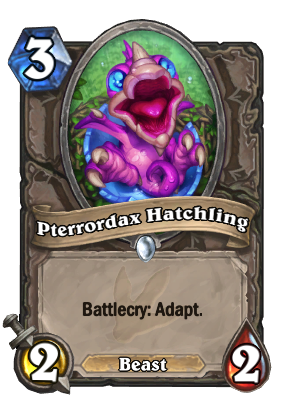 I'd say this round Cuteness gold medal goes to Pterrordax Hatchling, silver to Murloc Tinyfin... any thoughts for bronze? Um, no. Giant Wasp already has two good adaptations for the same cost. Silent Knight already had two of them as well. Wasted, pack filler card. Awww this thing is so cute. And it's so eager to Adapt! It's a shame it will turn into a bitter Ravenous Pterrordax that kills its friends to do so. good enough for zoo, especially if you get the deathrattle. Now I wish that dinosaurs were alive... WAIT! I have always wished that!